How can I find the exit out of a maze? How can I partition a treasure map so that the treasure can only be found if all parts of the map are recombined? How should I plan my trip to minimize cost? Solving these challenging problems requires logical reasoning, geometric and combinatorial imagination, and, last but not least, creativity – the skills needed for the design and analysis of algorithms. 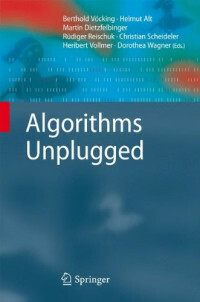 In this book we present some of the most beautiful algorithmic ideas in 41 articles written in colloquial, nontechnical language. Most of the articles arose out of an initiative among German-language universities to communicate the fascination of algorithms and computer science to high-school students. The book can be understood without any prior knowledge of algorithms and computing, and it will be an enlightening and fun read for students and interested adults.